the rest of the story | Apple pie, anyone? boy: I’m gonna try my luck in the deer stand at dawn. I have a really good feeling. girl: You bet. Also, I am the coolest wife you’ll ever have. boy: I got him. I got it. I got a 10 point. I got a ten point buck. boy: I’m not going to make it. I’ve been in this meeting all day and we’ve still got two hours to go. girl: Well, it’s cold enough. I’m sure Buck will be fine overnight. boy: Yes… but, uh. Um, I’m going to need you to take it in for me. boy: Seriously? Awesome. I’ll get it all ready for you tonight and put it on top of the Subaru. 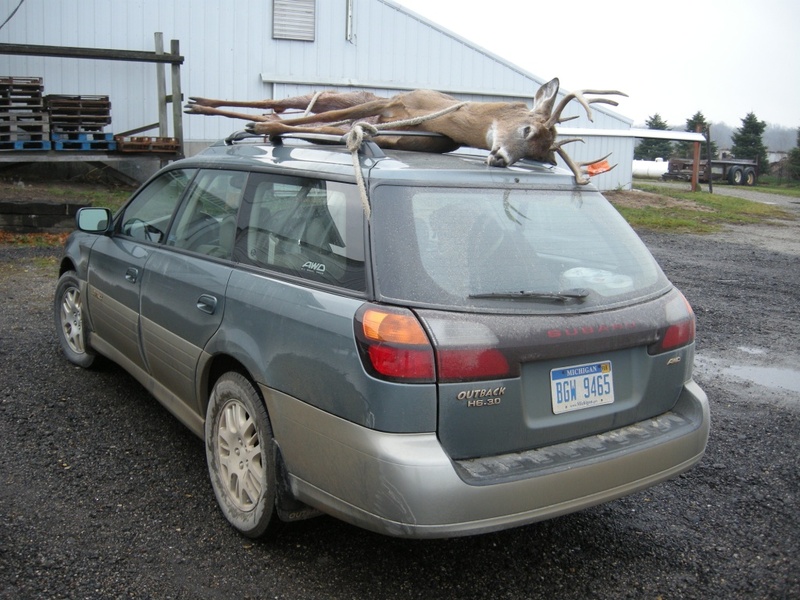 girl: On top of the Subaru? As in, strapped to the hood of the Ru whilst I drop Rylie off at preschool with hundreds of other small children, many of whom have emotional difficulties? boy: Just park on the side. I’m sure it will be fine. butcher: Wow! That’s a real nice catch! Did you do it? girl: Yes. Yes, I did. Please note the shadow of Abe in the Ru. This entry was posted on Monday, November 23rd, 2009 at 7:07 am	and tagged with conversations and posted in funnies, Uncategorized. You can follow any responses to this entry through the RSS 2.0 feed. I know! He even said he would, but he ran out of time. It was a sad, sad sight. I hope Curt thanked you a great deal after this adventure. I talked to several peers here who all said “no way”. Good job. you officially win wife of the year! i just choked a little on my cereal. hilarious! This is the best story in the whole wide world! I told ya’ll ta get a truck ….. At least I know you’ll be able ta take mine in too. You have to get one first, Pap. Let’s not put the cart before the horse, eh? Hey, don’t get grounded, okay? I want to come see Rylie while you’re in Texas and I don’t want to miss out on that because you backtalked to your dad and got in trouble. Thanks for the Monday morning laugh. I needed it!! I laughed so hard, snot came out of my nose. I LOVE LOVE LOVE that you lied. Heck yeah, I did. And I’d do it again. But, these people know me, so I don’t know how far the lie got before it got shot down. So to speak. Wow! That’s all I can say. Just “Wow!” You are awesome!! oh Thank you Thank you Thank you ….. So funny! What a great story. Hope Rylie had a great birthday! Oh my gosh that is hilarious! Yes, I would have to nominate you for wife of the year too because no way would I have done that. Oh Abe does not look too pleased either. Congrats to Curt though! I am afraid to start laughing…I may not be able to stop for awhile!! Have Steph tell you her childhood encounter with the “Bambi” hanging in our garage one night…dark garage, glowing eyes reflecting the house light, drops of blood on the garage floor…greatness…scars for life. Tell boy that is one fine rack he has there. yah. i met that deer. traumatically. i could not eat that deer. This might top the car wash “incident”. Seriously, WRITE A BOOK! Car wash still wins, hands down. But this is a close second. I’m laughing. La-FF-ing. i’m so glad we chatted this morning. this story made me smile all day. and to finally see the picture this evening…and abe in the back. there are no words. i love you. I love it! Best story ever. Today we were driving down the road of this neighborhood and there was this pickup on the side of the road with an 8-pointer laid out in the back. One guy guy was holding the antlers and another was sawing off the head with a hacksaw. (right below the chin). Naturally I put it in reverse to entertain my little future hunters in the backseat. we got there just in time to see him finish the head off (obviously not mounting that one) and hold it up with pride for us to see. It was a sight. I was happy that I am not easily grossed out. The boys were IMPRESSED as we are heading to the hunting lands of south Georgia with the in laws for Thanksgiving. BTW, I am so very impressed with the ten pointer though. Nice job Curt. Too funny…the things we do for the men we love! You are awesome! And hey, at least you weren’t the teacher having to answer all the kids questions about what they saw. I read this to Luke and showed him the picture- he was laughing the whole way thru. Now I’m worried that I might have given him some ideas for the future…oh well, it will probably happen one of these days, I may as well just come to terms with it now. I just read this out loud to my husband and mother-in-law. Laughing, I tell you, all 3 of us. Hilarious, hilarious story. I’ll be chuckling all day over it. Holy Cow, er, Deer, 35 comments. I’ve been sick, but this was worth the wait. Sorry, but I am laughing so hard.